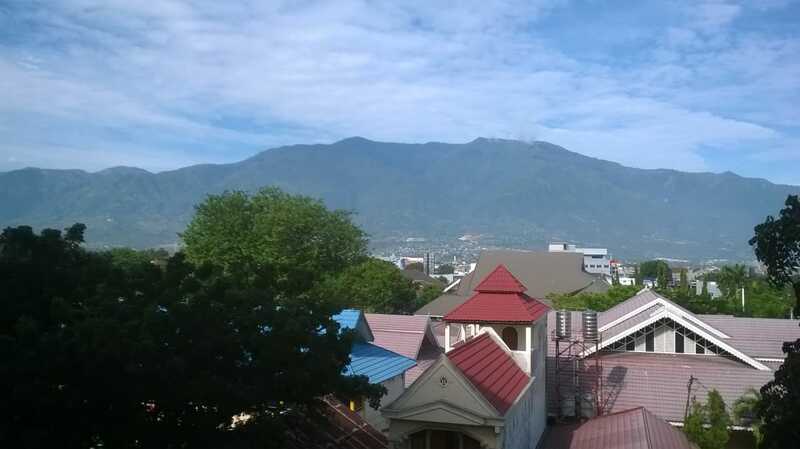 Gunung Gawalise is Palu’s iconic mountain and gives its name to a local sports stadium. Given that it is only about 20 minutes from a major airport with direct flights to Jakarta, you would expect that Gawalise must be one of Indonesia’s most accessible mountains. The views over Palu valley, bay and city are magnificent from its slopes, but considerable access issues remain at the foot of the mountain. Gawalise itself is actually at the northern end of a vast north-south mountain range running many kilometres down the west side of Palu river valley. Peaks to the south on this range include Bulu Nti and Torompupu (both Ribus). Gawalise has three minor tops all over 2,000m in elevation, the middle of which is the highest (but – like the south one – rarely visited). The most straightforward route up Gunung Gawalise is from the village of Desa Kalora (195m) which lies at the end of the road through the Silae neighbourhood. In years gone by, this was the normal starting point for many local student hikers and nature lovers but local people in Kalora have recently begun to prevent access to the mountain which is a real shame. However, what follows is an account of the traditional route from Kalora which may be of use if this trail once again becomes open. If not, try the alternative route starting further south from Desa Salena (details further down). It is customary to climb Gunung Gawalise at night and reach Batu Gantung (‘hanging rock’, 1,670m) for sunrise before proceeding to the northern peak with a triangulation pillar, Indonesian flag and summit signs on it. This is mainly due to the mountain being deforested until beyond Batu Gantung, which means a very hot and sweaty ascent in direct sunlight. However, there are several Pos with areas suitable for a small number of tents so a two days and one night camping itinerary would make sense (assuming no access issues in Kalora). If you do hike up during daylight hours, try to choose a cloudy day! On the Kalora route, farmers live in simple huts as far up the mountain as 1,180m. This means fantastic views down to Palu Bay, but the lack of shade from trees means a very hot hike as mentioned. The trail follows a thick metal water pipe at the very start, but there are several minor junctions so going with someone who has hiked here recently is a very good idea. The path is steep, muddy and slippery for much of the way, and coming down is harder (though usually faster) for most people. Pos 1 ‘Kelapa’ (300m) is reached after just 20 minutes or so and features, not surprisingly, a cluster of coconut palms, in addition to chili, papaya and moringa oleifera (‘daun kelor ‘- very healthy stuff!) A tiny hamlet follows at around 600m elevation (after a total of one hour from the starting point), consisting of 3 or 4 simple village huts surrounded by another cluster of coconut palms. There is a water pipe here but please be considerate and ask local people first before you fill up your bottles. Given how close this mountain is to a provincial capital it is quite amazing to see families living such simple, traditional lives up here. Another hamlet follows at 730m (after a total of 2 hours and 30 minutes from the trailhead) before the trail enters a tiny cocoa plantation (790m). You should have reached Pos 2 (960m) after a total of around 3 hours. Pos 2 is known to some hikers as shelter 1, but there is no shelter here except for a few clumps of large bamboo and indeed it is better known as Pos Bambu. Views down to the city are great in clear weather and if any of your party can climb palm trees then you may be able to enjoy fresh coconut juice! 5 minutes beyond Pos 2 is the final water source, 2 minutes to the right of the trail (signposted in 2018) and only a trickle from a bamboo pipe. Another 20 minutes up the mountain are a couple of flat rocks (1,170m) ideally suited to being sat on for a rest before continuing to the final hamlet (1,180m) which is surrounded by corn (‘jagung’) but commonly known to hikers as ‘kampung tengah’ which means middle village and refers to the village being about halfway along the trail from the trailhead to the northern peak. There are also occasional banana, clove and papaya trees up here. The trail then follows a ridge for a while – enjoy the relatively flat trail while you can! – before ascending to slippery boulders (1,370m) and finally Pos 3 (1,475m) which provides enough space for a small number of tents near a large (but seemingly unable to fruit) mango tree. Pos 3 is known as Pos Mangga (‘mango’). There are also some colourful yucca plants here of considerable height. It should have taken about 2 hours to reach Pos 3 from Pos 2, or 5 hours in total from the trailhead. If you are camping, this may be a good choice as it is only another hour to Batu Gantung or two hours to the northern peak and there are some tricky rocky sections to negotiate near Batu Gantung which are not easy with a large backpack. Batu Gantung (1,670m) is a brilliant spot. As the name suggests, there is indeed a hanging rock which the very brave may climb to take a photo. Views here are brilliant, especially at dawn and dusk. Look out for edelweiss and pitcher plants in the area, but be really careful as there are some deep holes between rocks here. Just a couple of minutes beyond Batu Gantung is another camping area (Pos 4) before the trail enters forest at an elevation of around 1,700m. What follows is a pleasant hour of strolling through forest on a reasonably clear trail before reaching Gawalise’s northern top which is crowned with a large cement triangulation pillar, presumably from Dutch times. There is a section of aircraft wreckage (from a Merpati plane which crashed on the mountain in the 1990s) near the pillar and it is used to collect a small amount of rainwater for use in an emergency. 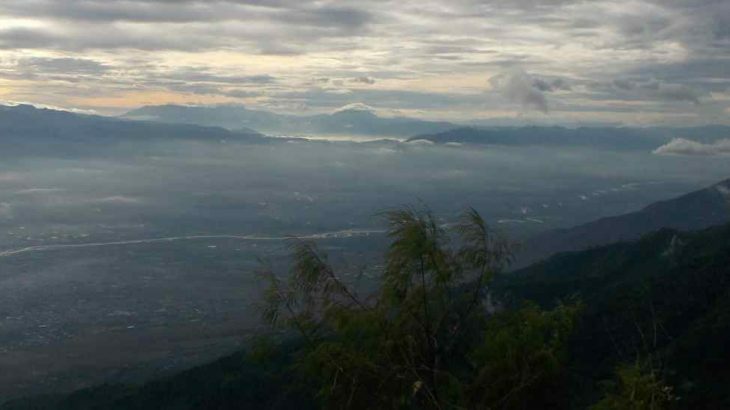 Although there are no real views here as the peak is forested, the atmosphere is very pleasant and calm, especially given how close to Palu city this mountain is. A sign for the Salena trail is nailed on a tree and points down to the left (east) from the pillar. The pillar is inscribed with the figure ‘2023’ but the very detailed Bakosurtanal map gives a height of 2,022m for this northern peak. The vast majority of hikers consider this to be the ‘puncak’ or ‘top’ of Gawalise, perhaps simply because it has a pillar on it. However, this is only the third highest of Gawalise’s 3 summits. Around 1.2km further south is the highest, middle peak of the mountain which is 2,029m in elevation and labelled ‘Gunung Uiayo’ on the Bako map. A similar distance beyond the middle peak is a more shapely, southern top which according to the Bako map is 2,026m. Whether hikers frequent these two higher tops is unclear. The Salena trail appears to head down to the east from the northern peak but I have heard that the trail (requiring 2 full days or ideally 3) may go via the middle (true summit) peak. It requires further investiagtion but it is highly likely that there are no views from the other tops. They are also probably unmarked. It should have taken you about 7 hours to reach the pillar from the trailhead and fit hikers could be back down in around 5 hours (not including breaks). This means it is technically feasible to do it as one long day-hike. However, there are several reasons why this is not such a good idea. Firstly, the descent is very tough going on the ankles. Secondly, you would presumably miss both sunset and sunrise at Batu Gantung (though you could consider hiking up at night for dawn there before proceeding to the pillar and then straight back down). Finally, and most importantly, the local people in Desa Kalora simply do not want hikers there and have made this clear since around 2016. Even with written permission from a senior local figure you may well suffer considerable problems (see comment/ trip report below for unpleasant details from 2018). This is a great shame given that Batu Gantung is on the Kalora route and also that this is the most accessible (and traditional) trailhead. It means hiking Gawalise as a weekend trip for Jakarta is not currently possible because the Salena trail is longer (requiring minimum 2 full days meaning flying out on Day 2 is probably not realistic). However, let us hope that the Salena route becomes more well-frequented and that both local hikers and local residents alike can benefit. There is probably enough demand that a local basecamp could be set up selling snacks and drinks to hikers as is common at the start of all major mountains in Java for example. All in all, a great mountain marred by hostility towards local hikers by residents. Bagging information by Dan Quinn (January 2018). Getting there: Under 30 minutes to reach the trailheads from Palu city and airport. Permits: You must speak with local village heads in either Kalora or Salena. Kalora is not recommended at the time of writing (2018) for several reasons. You will hopefully have better luck in Salena. Water sources: Currently unknown for the Salena route. For the Kalora route, the last water is about 2 minutes to the left of the trail at 985m just 10 minutes beyond Pos 2 (960m). Featured, Sulawesi Tengah Spesial. permalink. 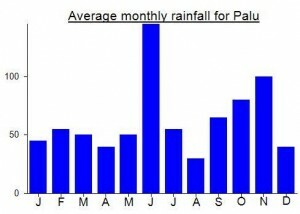 Very sad to follow the news reports on the earthquake and tsunami in Palu over the last few days. I clearly remember seeing the now-destroyed iconic yellow bridge down in the city from the slopes of Gawalise. Back in January, I was also on the same Batik Air flight to Jakarta via Makassar leaving around sunset on the way home after my trek as the one that absolute hero of an air traffic control officer, Anthonius Gunawan Agung, made sure was safely in the air before the building around him began to collapse and he jumped from the tower, later dying of his injuries. Awful. From the flight last week passengers could see the tsunami waves in Palu bay below. I hope my Lalimpala friends are all safe. Hi Dan, any chance you have a GPS track from your Gawalise climb? Much appreciated! (1) There were landslides on the mountain at the time of the earthquake so the trail may be impassable in places. (2) As in the write-up, some locals may not want you hiking here. Good luck – would be interested to hear how you get on…..
What an odd hike this one was. As usual for this area, I got help from the great folk of Lalimpala, Tadulako University’s finest hiking club, and perhaps the finest in Sulawesi. Alas, the day before we were due to begin hiking, I was informed that access was very difficult and that a group who had asked to hike earlier the same week had been denied entry by the kepala desa. This was not the thing I wanted to hear having already booked flights and packed my bag. In the end, we decided to try anyway, with the hope that we would be granted permission to document the trail for this very site. Flew in with Batik direct from Jakarta. Perfectly on time. Straight to Kalora. A bit of light rain… much better than blue skies as otherwise the hike would be very tough going due to the lack of shade. After a bit of asking around we finally located the Kepala Desa’s house and had a chat to him and gave him some documents (photocopied IDs and a letter from the University hiking club). He said that locals had indeed closed the trail over the last couple of years due to litter and ‘males going up with females’ and such like and had tried to cross onto the trail from neighbouring villages. I couldn’t help but agree with him on the litter part, and commented that it was related to education, but it still seemed odd to prevent people from walking up a hill. Anyway, he gave us his permission to document the mountain as part of my project (which has recently focussed on this region) and off we went. The weather was reasonable… light rain making for a slippery path but much preferable to baking hot. The wind picked up and the rest of the team were very concerned about trees blowing over higher up so we camped at Pos 3. I was concerned too, less about trees blowing down but more about the remaing distance to what seemed to be the highest peak based on research. It was still 2.5km away or so. We were up at 3am the next morning and up at Batu Gantung in just 45 minutes. I had no idea it was so close so we continued to the pillar, which only took another hour. My GPS gave a reading of 2022 to 2030 so 2022 or 2023 sounds about right. The GPS was showing that the probable higher peak was 1.2km away to the south, but given I was flying back to Jakarta the same day and it was by no means clear that there was a trail over to it meant that I had to be content with the pillar peak only and we woud examine the Bako map at Lalimpala HQ once we had descended. Back down at Batu Gantung at around 7am and the view was utterly beautiful over the Palu river valley, Nokilalaki in the distance, Gunung SIdole over the other side of the bay, Batu Gantung like a mini pinnacle, and the city itself almost 1700m down from us! Back down at the village several hours later, with very knackered legs, we searched for the two motorbikes which had been moved from the place they were left. They were in the old mosque next to the new mosque. But something was wrong. Both bikes had flat tyres. Very suspicious. And sand had been thrown on both the bikes and the helmets. One of the keys would not fit into the ignition either. They had clearly been tampered with. The guides managed to start one bike and the plan was to go down and get the tyres pumped up. I waited for this first bike to return. I waited quite a while. Compared to the villages at the foot of Bulu Nti and SIdole, this was not a friendly place. Locals feigned ignorance of the flat tyres and key issue and kept their communication to a minimum. Being a foreigner in these villagers one can often feel almost like a prisoner, being watched continually. It is very tiresome and probably the least enjoyable part of hiking in Indonesia…. the ‘zoo’ factor. I decided to walk down to the main road with my bags and wait there. It turned out the tyres had not simply been let down on both bikes, but had been damaged so severely that the inner tubes needed replacing. The first bike, at least, had been emptied of fuel to the point that it was completely ‘dry’. Strange gifts from the villagers after having received permission to hike the mountain. Even if we hadn’t….. this is totally unacceptable. This being Indonesia, there is little point involving the police as it just makes the problem larger. Ultimately these folk had two options…. they could embrace the opportunity of local hikers wishing to visit and set up a basecamp and make some money out of their situation living at the foot of a decent mountain. Or they could be hostile to those that try to enjoy it. They have clearly chosen the second. How sad. We managed to get back to the University with still-flat tyres and unusable helmets and friends were sent to help the remaining two with the second bike. I had only 30 minutes before it was time to check in for my return flight to Jakarta, but I examined the Bako map and found that the pillar peak is only the third highest on Gawalise. Perhaps I’ll be back to try to Salena route, though that village was in the news a decade or so ago due to fatal clashes involving police and shamans. Perhaps things are much calmer there now. A very odd weekend! But many thanks to the fine folk of Lalimpala as usual.